The market for liquid food packaging is changing rapidly. There is a clear movement towards the use of plastic packaging over the more "traditional" forms of carton or glass. However, the plastic industry itself is changing very quickly as new markets develop their own particularities. I have recently had the opportunity of mapping the develpment of the market for PET PreForms in Central and Eastern Europe where a vibrant industry has been built up based on the growth of locally capitalised manufacturers. It has been interesting to observe that the more successful participants in the industry value chain have adopted Key Account Management as a means of consolidating their market positions to great effect. 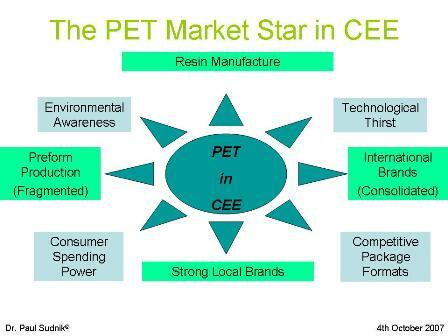 Today it is fair to say that the Stong Local Brands (shown at the bottom of the model) are in a leading position in many of the CEE markets and are giving the large "Western" manufacturers of PET PreForms a tough time in the market. Interestingly I have found evidence that some of the small manufacuturers are actually trying to place a value on their Key Account Management activities by rearranging their accounting methods in an attempt to evaluate the impact of Key Account Management. Whilst this is probably accepted practice in the multinationals with whom they compete, in this context it appears to be a highly sophisticated form of Key Account Management that is being practiced.